Whether you call it renovation, progress or gentrification, it is undeniable that our neighborhood is going through a process of change. The response ranges from aesthetic discomfort to international media coverage, and generally carries a lot of emotion. Therefore, we decided to take a closer look at local building projects completed in the recent years, and what we found out will surprise you! Using PLUTO’s database, we found that this urban transformation has been taking place since 2000 through 541 renovations and 1089 new constructions. 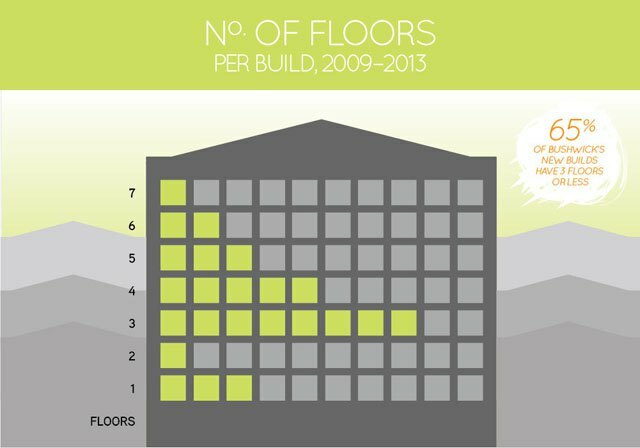 We sorted the latter by completion date and created the graphic that shows the amount of new buildings per year (see above). 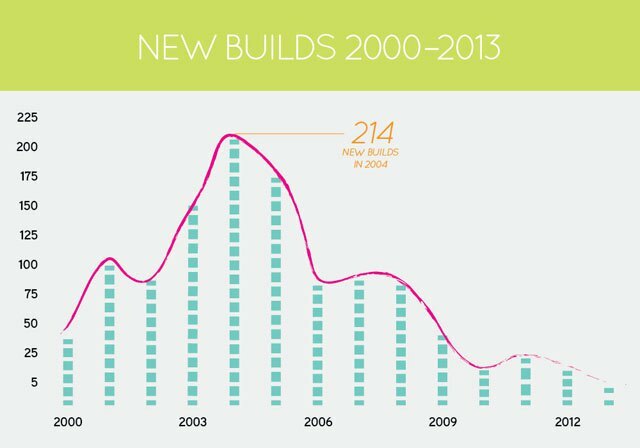 You can see how the construction boom of the early aughts had its highest spike in 2004 reaching the maximum of 214 new buildings; the tendency started declining towards the 2008 economic crisis. We were particularly interested in the post-crisis constructions, because the amount of buildings completed between 2009 and 2013 (PLUTO’s data contains information up to October 2013) was less than the total of buildings completed in any year previous to the economic collapse. Where are they and what is their use? Out of the 87 constructions completed since 2009, 8 of them are commercial, 2 are industrial and 2 are parking buildings. 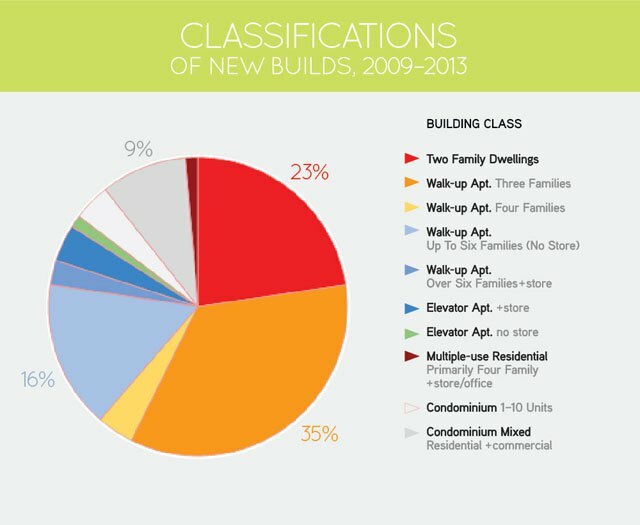 The remaining 75 builds (representing 86% of the total) are used for housing or housing in combination with commercial uses. Unfortunately, 10 buildings with mixed-use only feature retail or office uses, none of them includes community services or public institutions that serve cultural, medical or educational purposes. The data on the map above confirmed our suspicion that most of the new developments is be located in the north-west part of the neighborhood, closer to Williamsburg's real-estate boom and the J,M,Z and L subway lines. 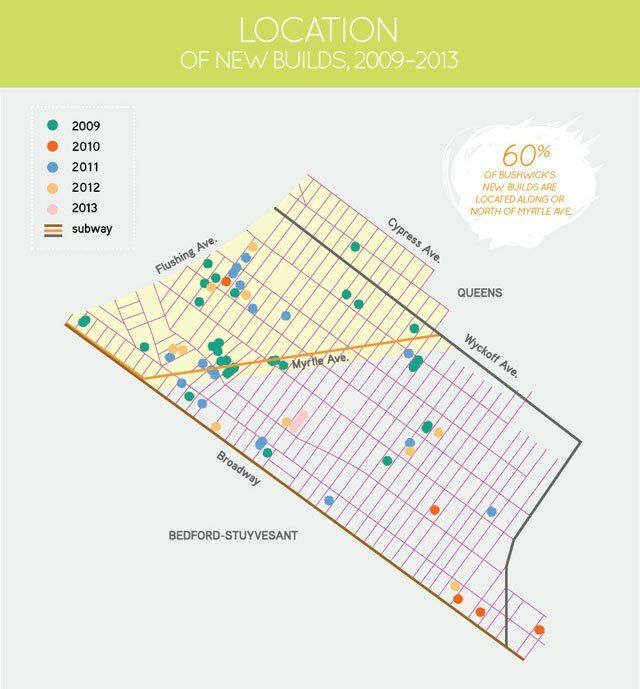 As shown in the map, 60% of the new constructions are located along or north of Myrtle Avenue’s axis. We didn’t look for luxury tags or affordable housing percentages, discussing these categories requires a separate think piece. However, we can tell you that out of the 75 residential properties we studied, 3 are owned by the city or the state, 35 by corporations (most likely to be rentals), 27 by natural persons and 10 of them are condominiums. The latter figure was surprising, as you would think that the usually demonized condos would represent a bigger percentage of the sample. That being said, they still represent a considerable number if compared to the 18 condominiums built between 2000 and 2008. With rare exceptions, the architectural relevance of the sample is not worth much discussion. We looked at the most common materials and shapes. Beige, gray and red brick are equally common and the most predominant facade materials. Even though red brick has been traditionally used in the neighborhood, its contemporary usage differs a lot from that of the mansions and row houses of early Bushwick. In terms of volume and form, most building seem to be ruled by low budget and low creativity, as many feature generic forms in plain shoebox style. What could be better about these buildings? Aside from subjective aesthetic judgments, the most critical finding was the low height and density of the majority of developments. Density is determined by the FAR (floor to area ratio), which is the ratio of total building floor area to the area of its lot. For example, on a 10,000 square feet lot with FAR of 2.0, the maximum built floor area is 20,000 square feet. 96% of the studied properties are located in R6 zoning, which allows for FARs between 0.78 and 2.43; this is one of the main reasons behind the mere 628 new units were put into the market between 2009 and 2013. The median built FAR of the sample is 2.4, a low ratio that is verified by the average of floors and number of units per building. 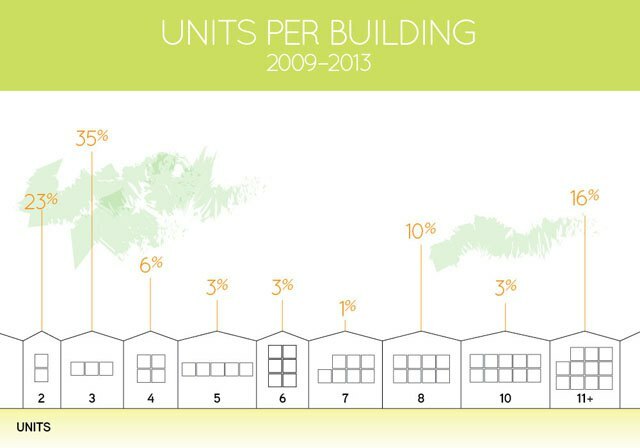 The data shows that more than 65% of the buildings have three floors or less, and 58% of them have three or less residential units per building. Although this has been the historical ratio, we wonder if constructing at these heights and densities will alleviate the housing deficit in a neighborhood with exponential growth and desirability like Bushwick. Despite the recent construction, there is a considerable amount of available space in our neighborhood comprising of 317 vacant lots accounting for approximately 867.000 square feet, plus garages, parking spaces and properties that have small buildings on their land. In the midst of a recovering economy, already sparking a new construction boom, we hope that de Blasio's looming housing plan allows for higher, denser and more affordable buildings as he said. An increase of available units housed in taller and denser buildings means more people finding homes and doing it at better prices. Some may be concerned about losing the neighborhood's character, but the value of Bushwick's character is its people and not the scale, looks or historic relevance of its buildings. We yearn for an ongoing neighborhood improvement in which new and old inhabitants can coexist; developing denser and taller buildings with more diverse uses is a viable way to achieve it.